If you’re one of the many Bartlesville dental patients who want to achieve a whiter, brighter smile, it’s time to visit Dentistry by Design. Our skilled cosmetic dentists offer in-office and at-home teeth whitening plans. Customized to your individual needs, your teeth whitening plan will deliver smiles up to ten shades brighter in a single day or over the course of a few weeks of treatment. 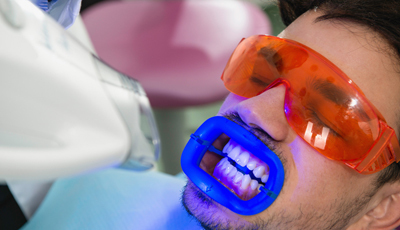 If traditional teeth whitening is not an effective solution for you, we can also provide other more advanced services that will deliver a beautiful, healthy smile. Contact us today to schedule your cosmetic dentistry consultation. We’ll evaluate your current situation and help you find the right treatment to deliver your desired results and leave you with picture-perfect smiles. A popular solution for patients who want to brighten their smiles quickly, in-office teeth whitening only takes about an hour to complete. We begin by protecting the soft tissue using rubber dams. Then, we apply a coat of whitening agent. After about twenty minutes, we will check your progress. This process is repeated until patients achieve their desired results. Professional take-home teeth whitening kits include customized doses of whitening gel and custom crafted application trays. Your plan will be personalized to achieve the desired teeth whitening results and fit your schedule. However, the basic treatment will require you to wear your whitening trays for about thirty minutes each day. After two weeks of these daily applications, you should achieve the same results possible with in-office whitening. At-home kits are preferable for people with sensitive teeth and those who prefer to brighten their smiles more gradually. If you’ve already invested time and money trying over the counter teeth whitening products, you’re likely already aware that these products do not deliver the teeth whitening results they promise. The reason these products are ineffective is twofold. First, the FDA highly regulates the allowable dosage of active teeth whitening agent. Because the allowed level of whitening agent is so low, it is unable to remain active for more than a few seconds. Added to that, the application methods for these products are also ineffective. To ensure the whitening agent remains effective and removes stains, neutralizing saliva needs to be blocked from the surfaces of teeth during the whitening process. Store bought teeth whitening gels are unable to keep whitening agents where they belong on the surfaces of teeth. Professional teeth whitening uses higher doses of whitening agent and effective application methods to ensure brilliantly white results.